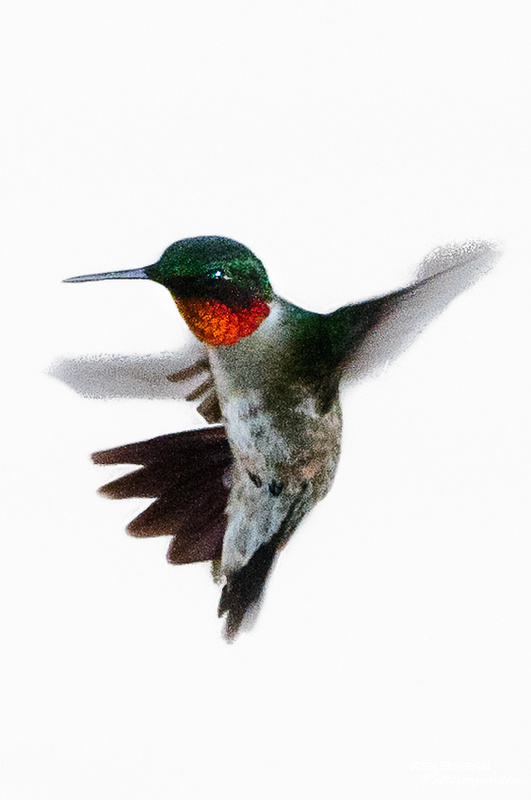 I was intrigued by the mid-air acrobatics of one of our hummingbird friends and, despite it being a noisy, background cluttered image, I thought maybe we could make something out of it. Here's the original image. Using Lightroom's Adjustment Brush, I selected the area surrounding the hummingbird being careful to us a softer edged brush around the "wing blur" and a brush with a more defined edge for the rest. Once satisfied with my selection I moved the Saturation and Clarity sliders for the selection all the way to the left and pushed the Brightness slider to the right until I achieved a pure white background. Still on the "grainy" side, but in this case I think the extra texture gives it a little character :). Have you ever tried "High Key" photography? Whether in the studio or in post processing? Drop a link in the comments and show us your stuff. We'd love to see it.